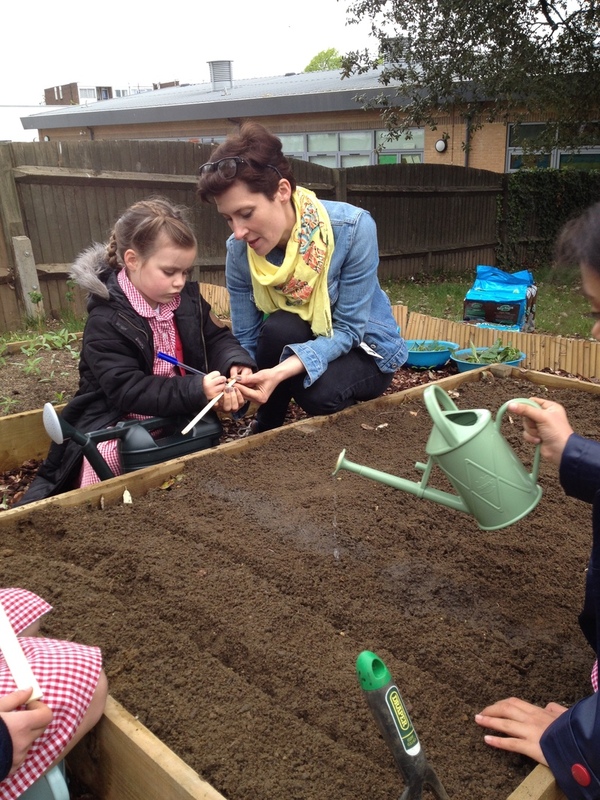 The Roots to Green Living project in Ealing, Hillingdon and Hounslow ran from September 2014 to July 2015, offering 10 days of support from YPTE’s Education Officers, Jess Smith and Mariel Harrison, together with up to £1000 towards developing the school grounds for environmental education. 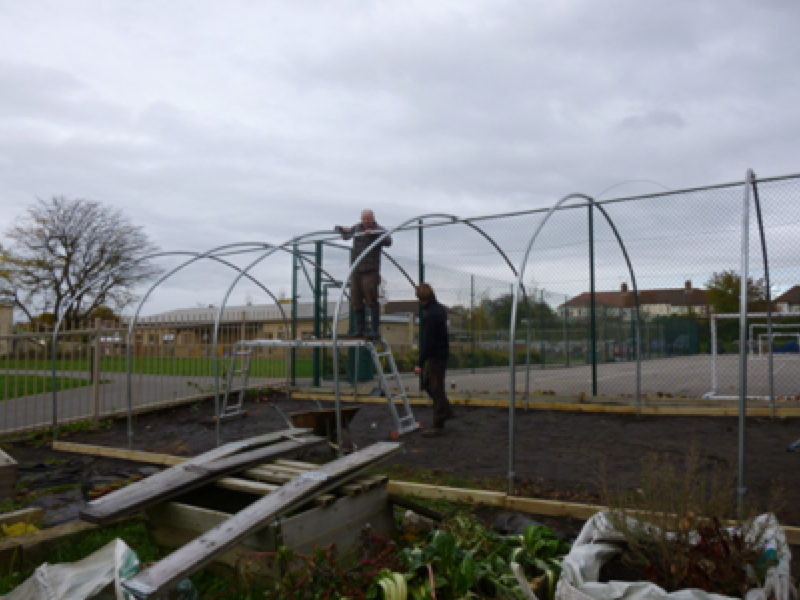 The project was funded by Heathrow Community Fund under the Communities for Tomorrow scheme with additional funding from the Ernest Cook Trust. 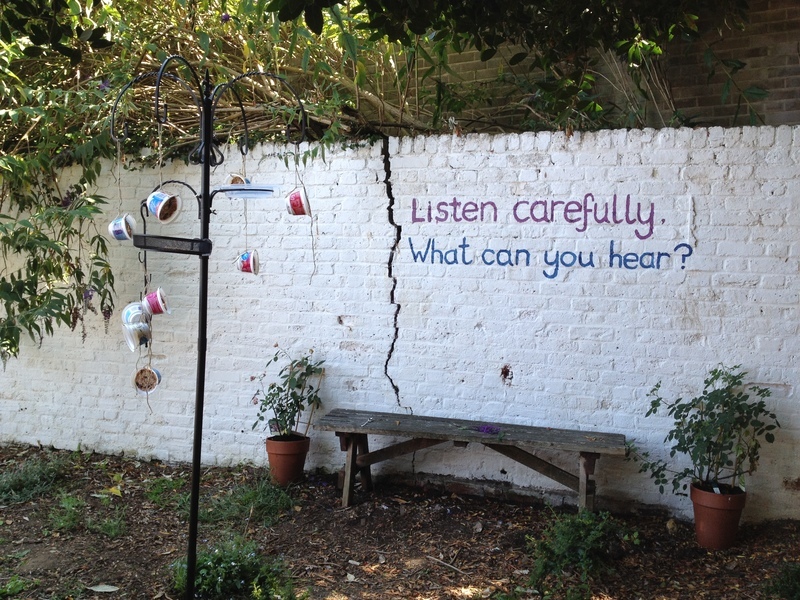 At Norwood Green Junior School, we worked with Year 3 and their teachers. 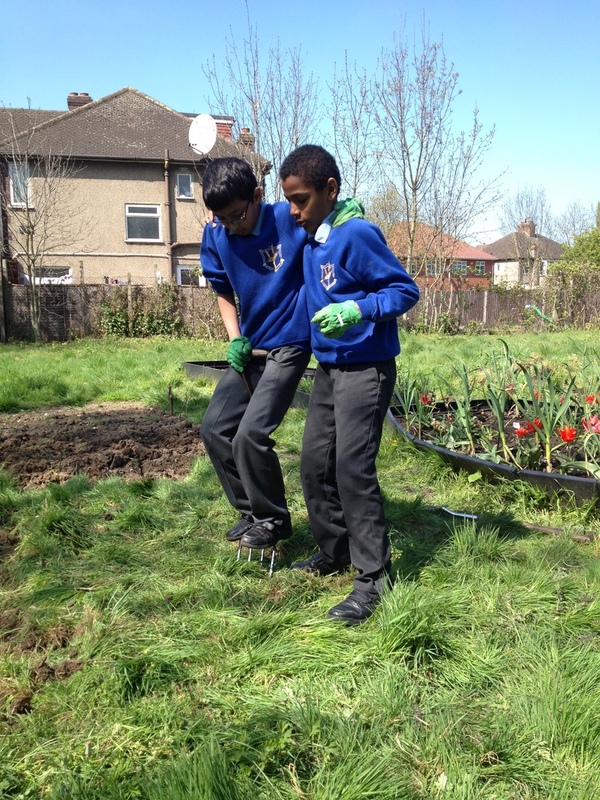 We decided to create a new allotment area in an area of the school field that was unused. 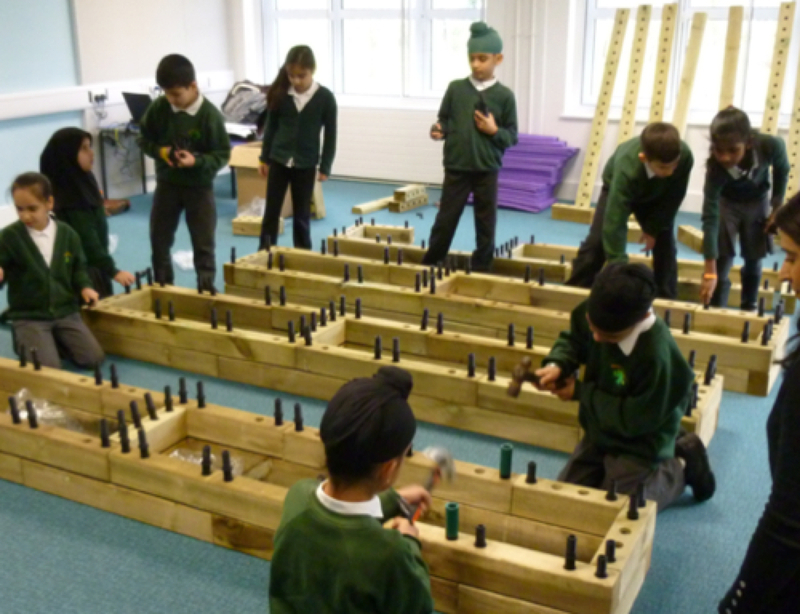 The teachers wanted a project in which the children were involved in the whole process, from building the raised beds through to harvesting and eating their produce, so we bought special raised beds that can be constructed by children using wooden blocks and dowels. 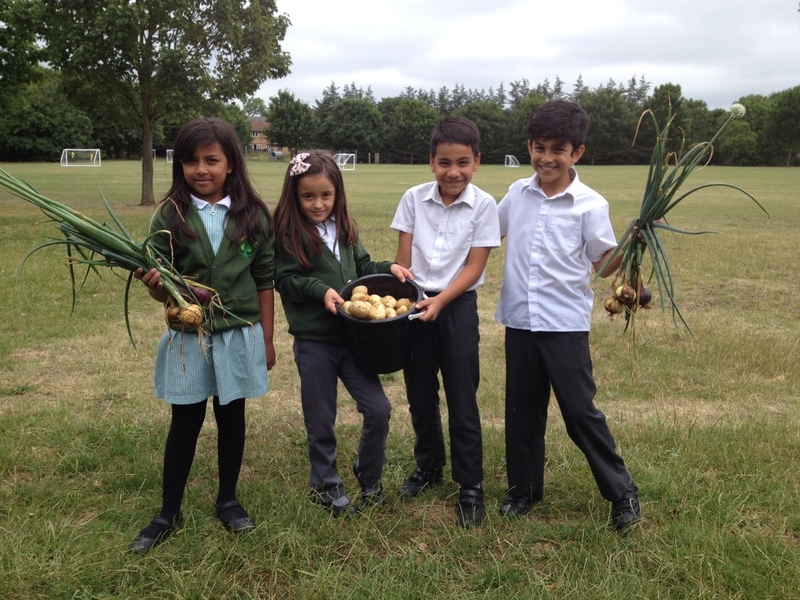 We decided to grow potatoes and onions, which could be made into potato salad and onion bhajis at the end of the summer term. 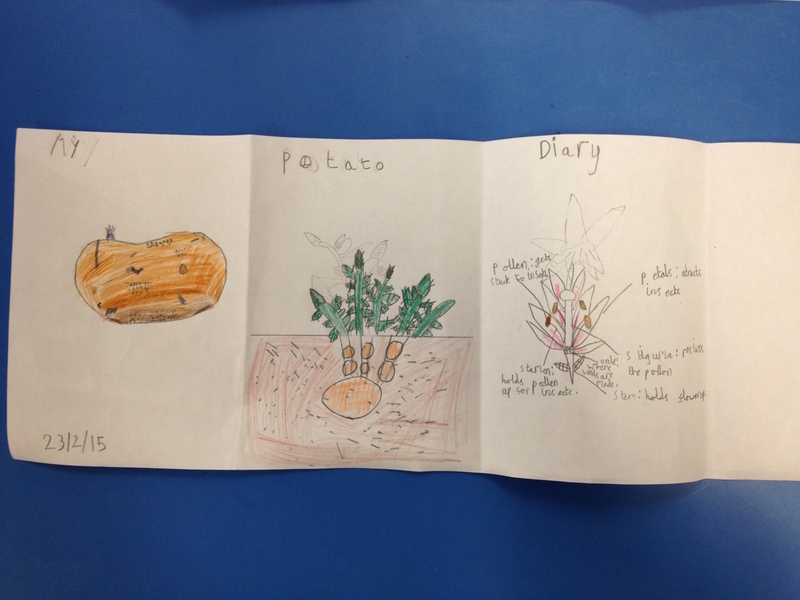 The Education Officers worked with all 90 children in Year 3 to plant their potatoes and onions and keep ‘potato diaries’, recording each stage of the potatoes growth with observational drawings. At the end of term, all the children got their hands dirty digging up the potatoes and were thrilled to see how many new potatoes had grown where they had each planted just one. All the children got to take a bag of potatoes and an onion home to cook with and eat. 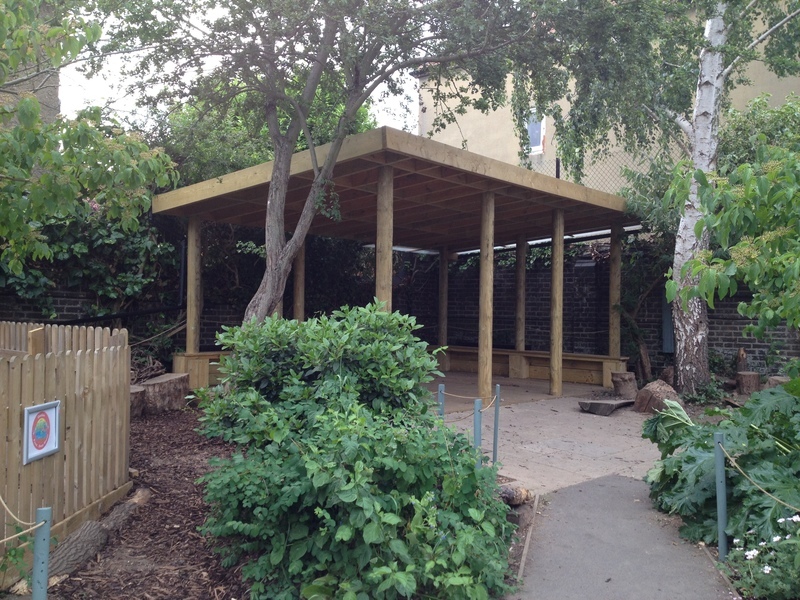 Oaklands Primary School had already been fundraising for a new nature area and outdoor classroom, so YPTE contributed towards the costs of building it. 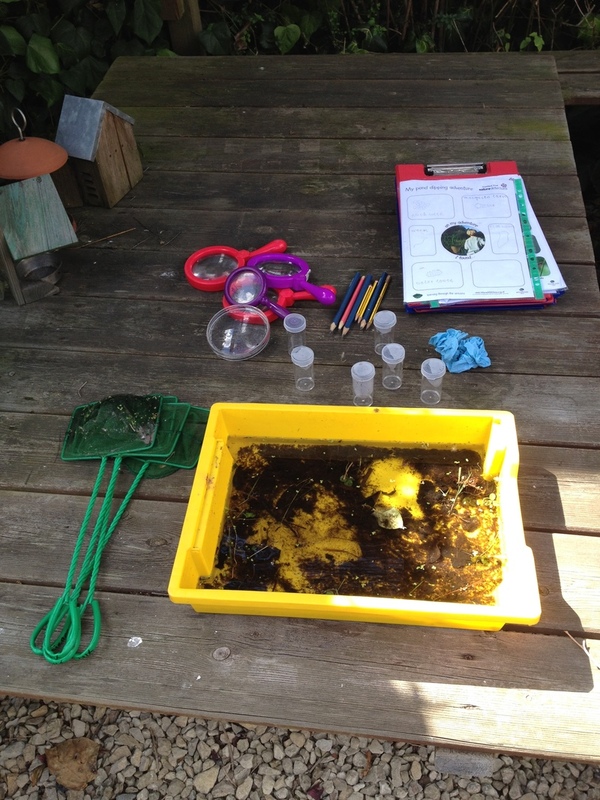 Mariel provided two weeks of sessions for every child in the school to explore the new nature area, identify mini beasts and their habitats, and see what they could find living in the pond, which was already home to a number of newts! 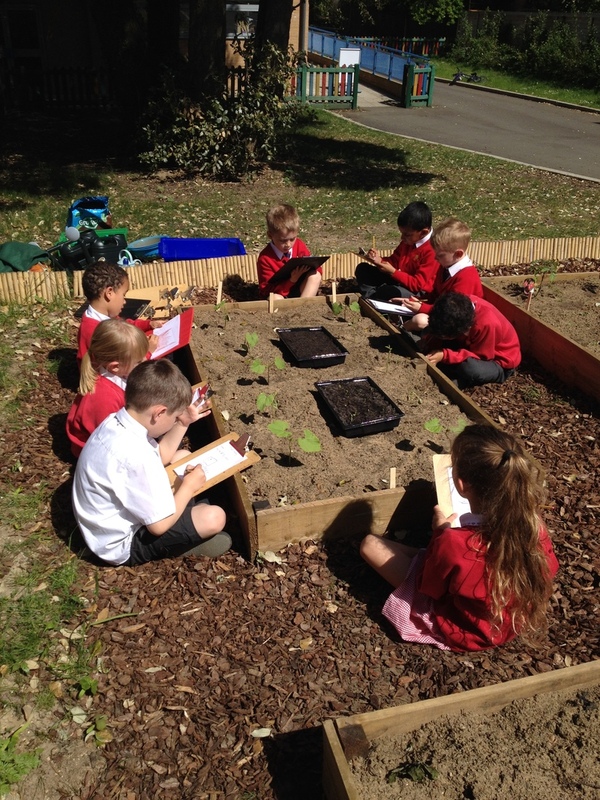 The Oaklands Green Team are taking on the role of maintaining the nature area, and all the children are loving playing there or sitting quietly during playtime. 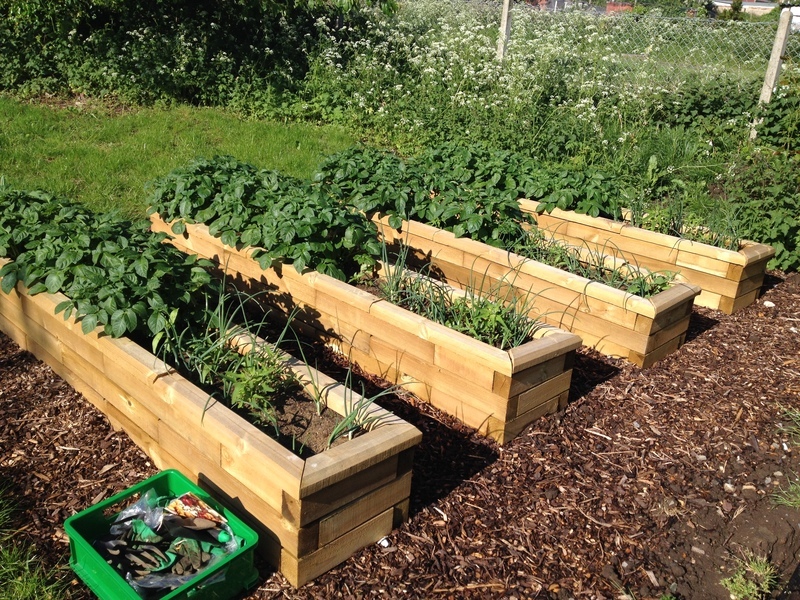 Oldfield Primary School already had a couple of raised beds in a playing field, used by the community and parents. 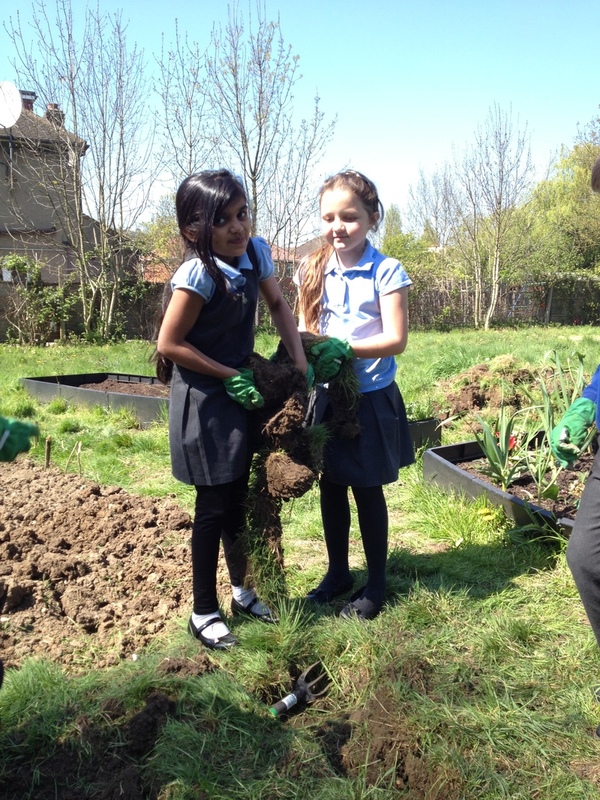 We worked together to create a plan for an improved ‘community allotment’ area that the children could use too. We started by planting a dogwood border and some fruit trees, which we hope will grow up to block out some of the sight and sound of the A40. We added new raised beds and rose arches (all assembled by the children), and planted a combination of flowers, shrubs and vegetables. 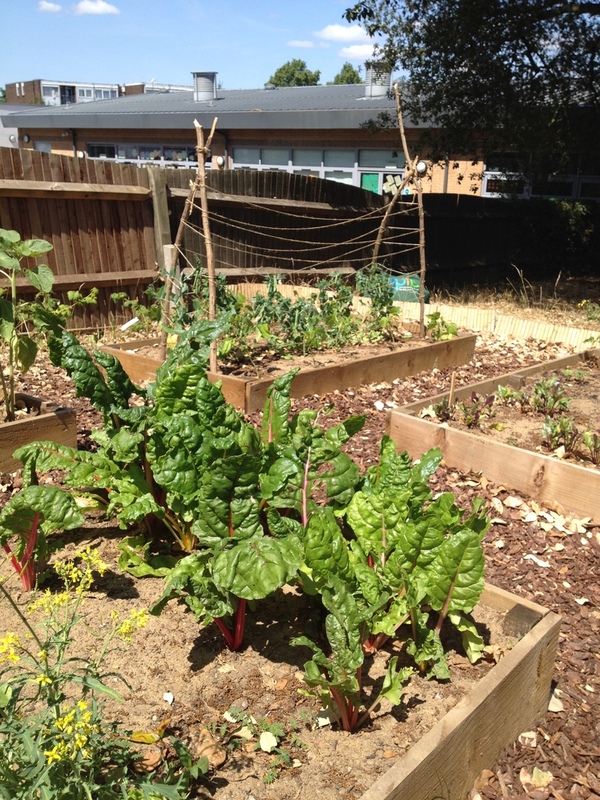 The children all worked really hard to make this garden a success, and were rewarded with an abundance of salad, beetroot, carrots and beans to enjoy at the end of term. The school plans to add more liner and bark chippings to the area in the autumn term, and plant a ‘living fedge’ from woven willow along the front. We (and the children) can’t wait to see finished garden! 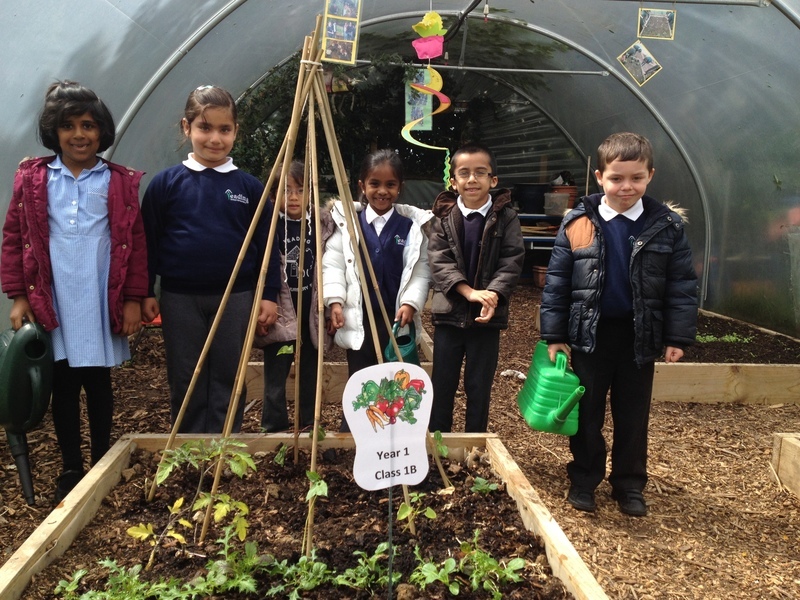 Perivale Primary School already had a small allotment area, but the teachers were not keen to use it in bad weather. 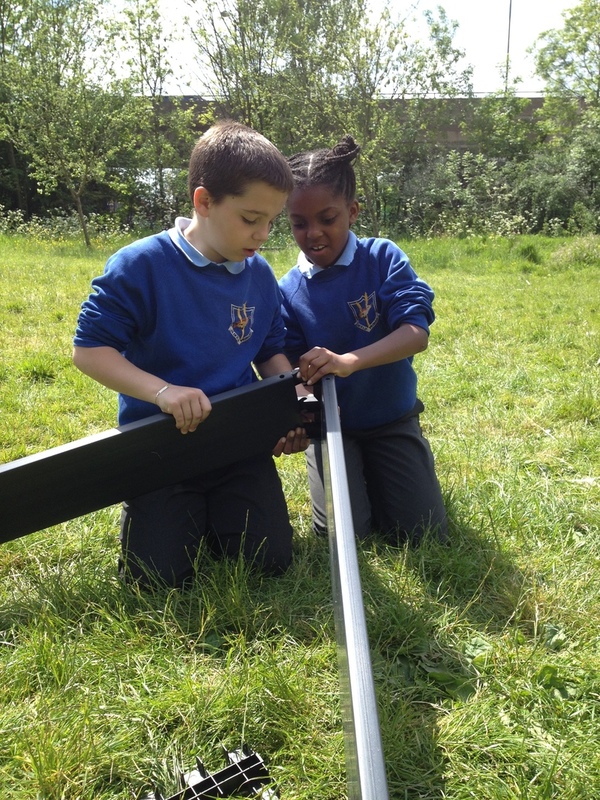 We therefore decided to build a new polytunnel, which could double as an outdoor classroom. 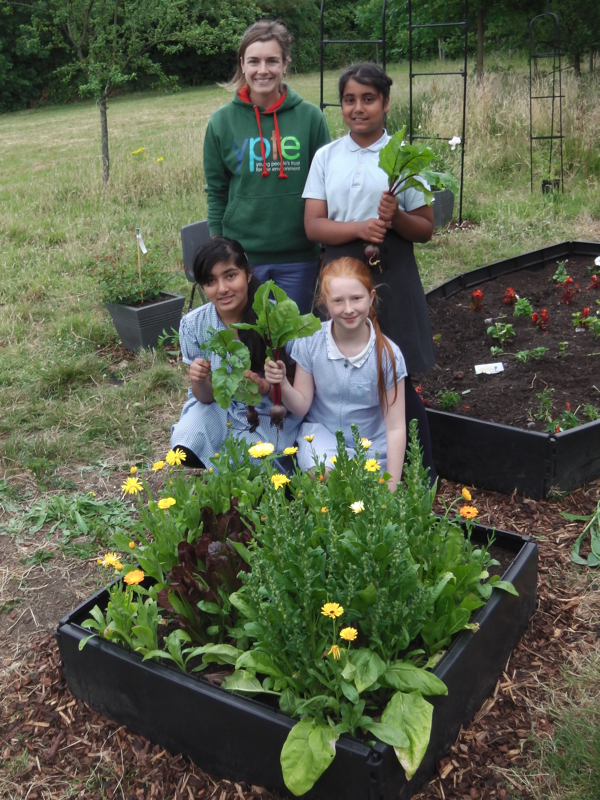 We worked with Year 5 to plant a huge range of fruits and vegetables, transforming a previously abandoned patch of ground into a thriving area of squash, beans, peas, sweetcorn, potatoes, beetroot, radishes… the list goes on! 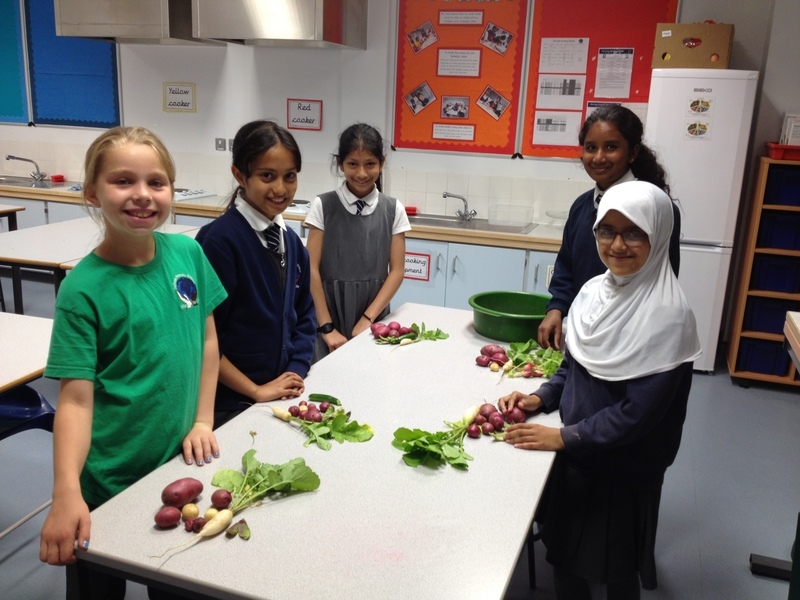 Year 5 were able to harvest some of their produce before the end of term to taste-test in class or take home. The rest should be ready and waiting for them after the summer holidays. 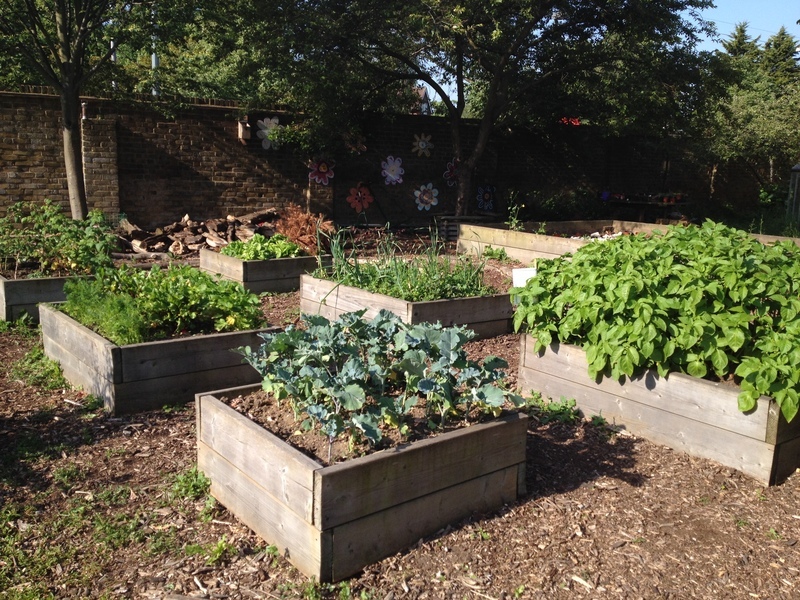 At St Gregory’s, we transformed a previously unused piece of land into an allotment area for Year 1 and Year 2, and created a wildlife-friendly sensory garden for Reception and Nursery. 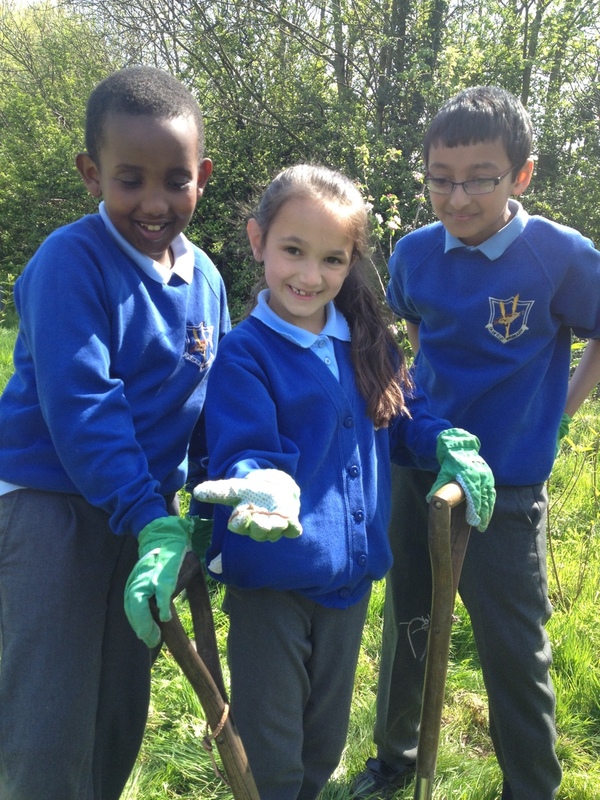 Jess worked with parents, teachers and grandparents to clear the area for the allotment and build six new raised beds. 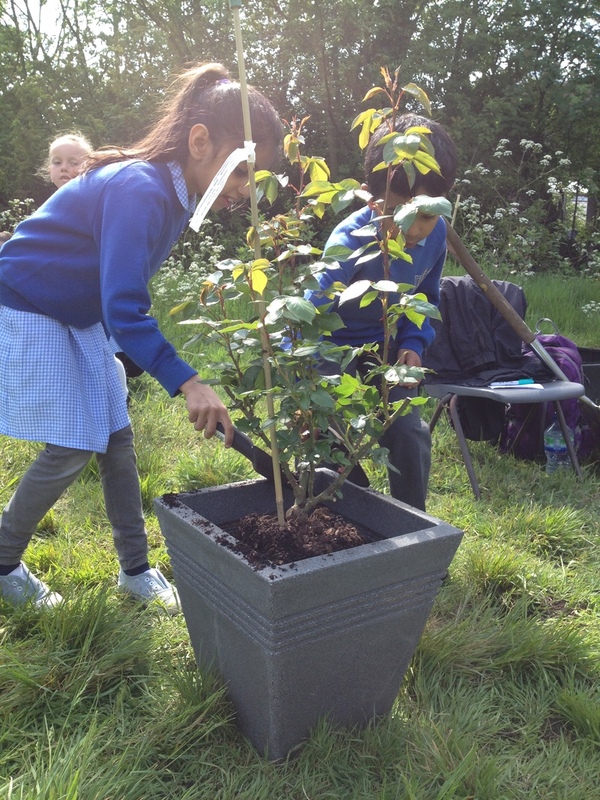 Mariel worked with Year 1 and Year 2 to plant them with a combination of flowers, fruits and vegetables. 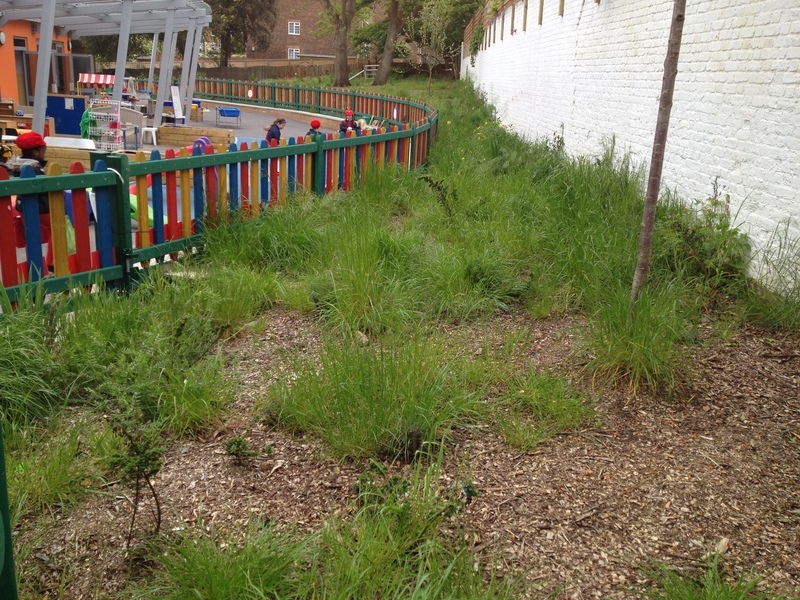 Year 2 took on the responsibility of watering the beds each day, and got to see everything grow up fast. 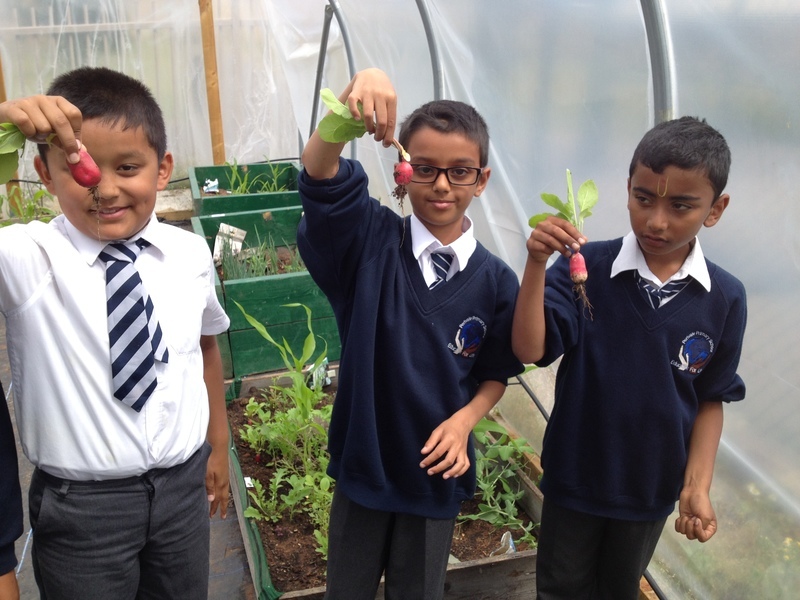 Before the end of term, we harvested salad leaves, radishes, peas and beans, which they tried in school and took home. 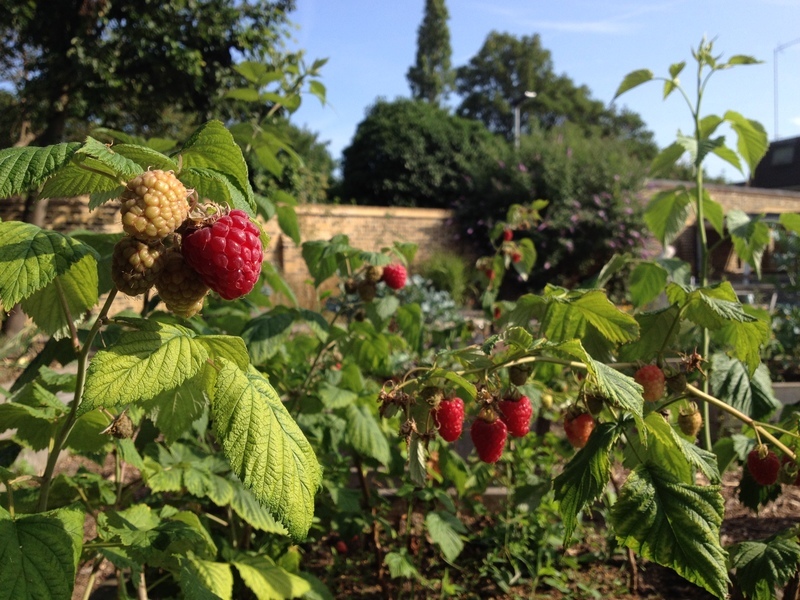 For the sensory garden, Mariel cleared a large area that had become overgrown with grass, and planted roses, a mix of herbs, and alpine strawberries to add to the lavender already growing there. 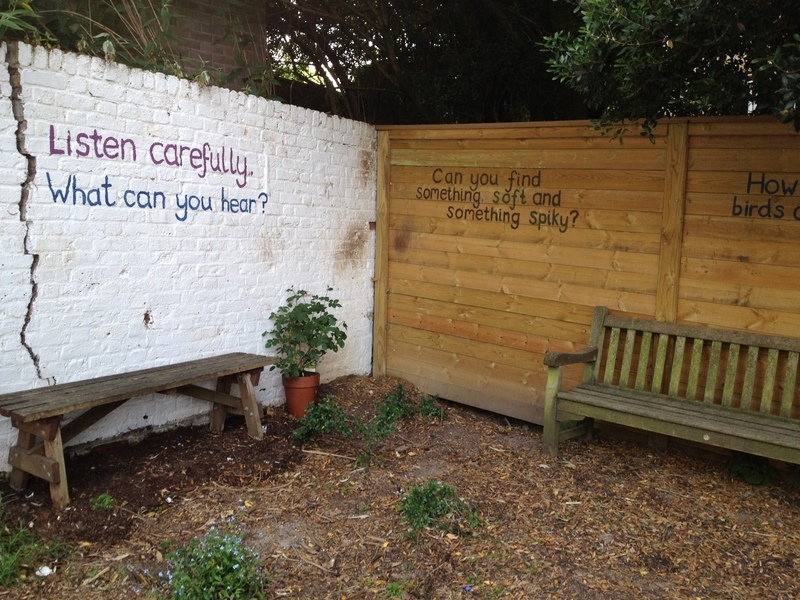 Mariel painted questions onto the walls to make parents, children and teachers think about how to use their new garden area. 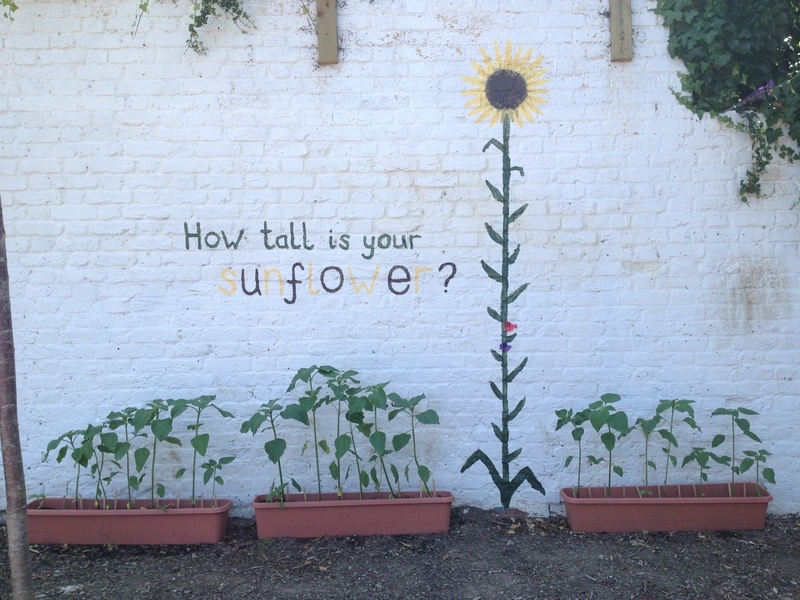 Reception all planted sunflowers and had a competition to see who could grow the tallest one, which they measured against a ruler we painted onto the wall. Reception also made bird cakes to hang from a new bird feeder in the quiet corner. 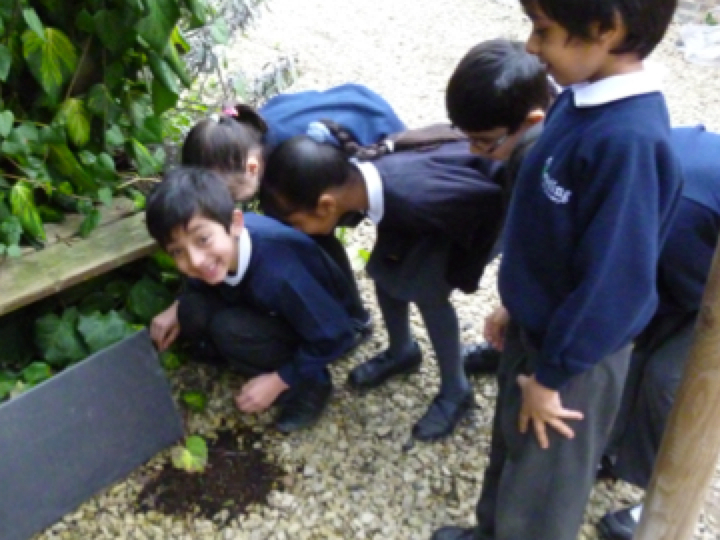 Nursery learnt about mini beasts and enjoyed hunting for them in their new garden. 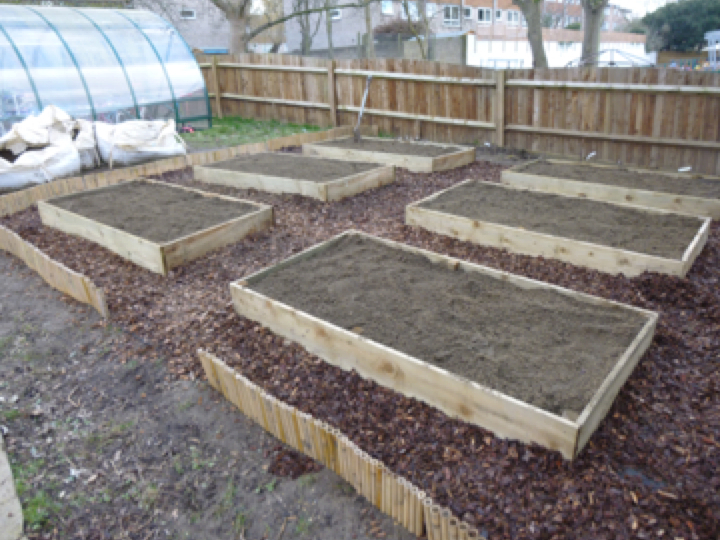 St Mary’s Primary School already had an allotment area with a few raised beds and a greenhouse but many of the teachers lacked confidence using them. The Education Officers therefore developed outdoor lesson plans for each year group which the teachers could observe and use in the future. 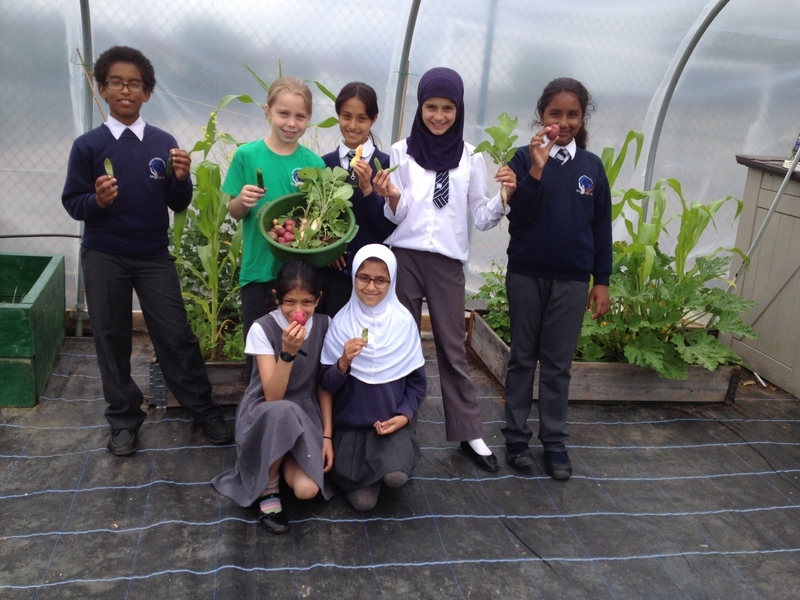 The children planted a variety of fruits and vegetables in the raised beds, which they observed growing and harvested towards the end of the summer term. 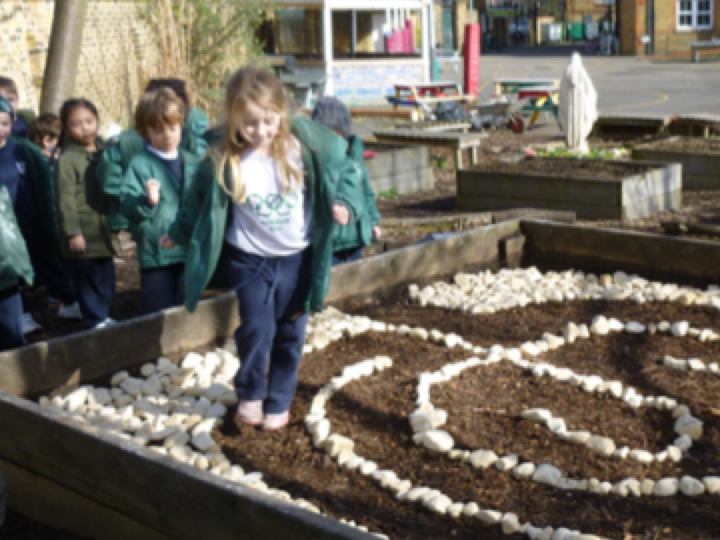 In one raised bed, too large to be used to grow vegetables, Jess worked with Year 6 and Reception to create a Prayer Labyrinth using ornamental bark and white cobbles. We also created wind chimes from recycled materials, as well as bird feeders and wormeries. 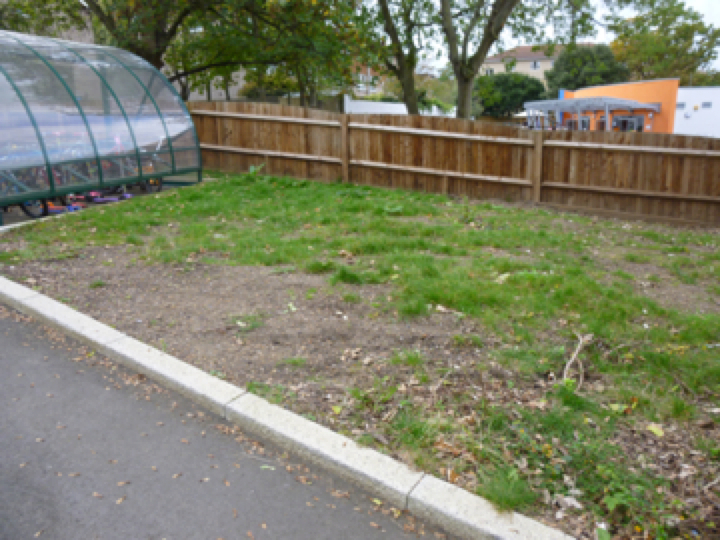 Yeading Infants School are fortunate enough to already have a great deal of outdoor areas, including allotments, a pond, and a large forest school area with bird hides. Jess and Mariel worked with the teachers to help them to utilise these areas in a more productive way. 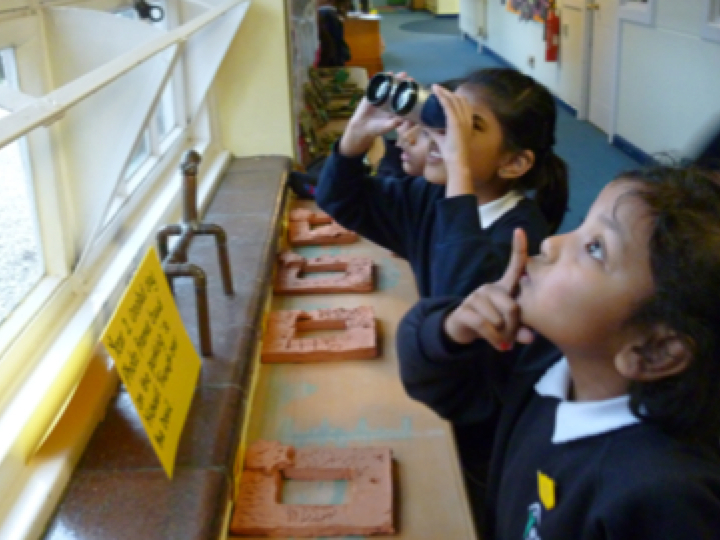 We made bird cake to hang in the playground, and then participated in the RSPB’s ‘Big Bird Watch’. The children were all very excited to see birds eating their bird cake! 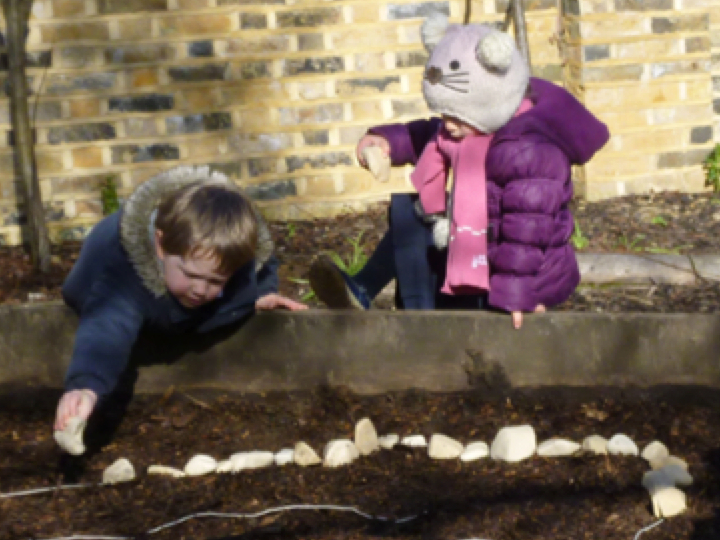 They also created ‘footprint tunnels’ to see which small mammals lived in their playground. 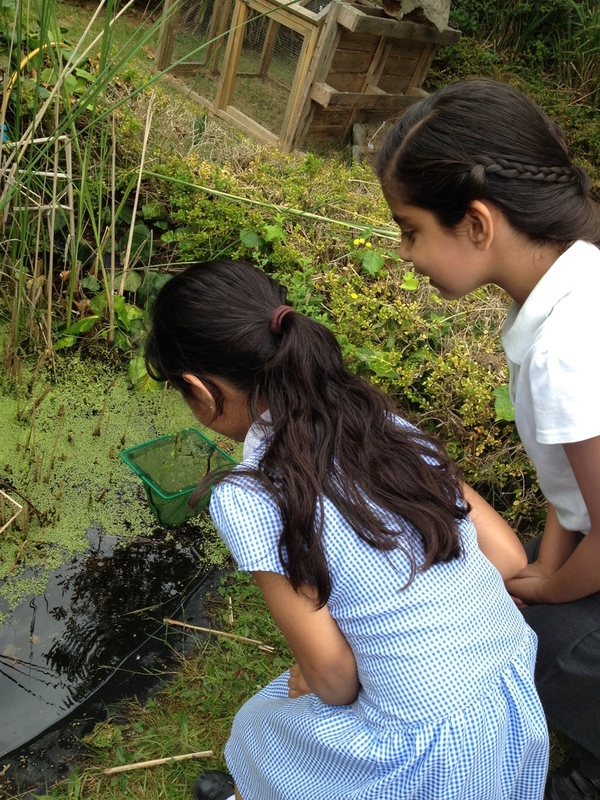 In the summer term, Mariel spent a week clearing the small pond and pond dipping with Year 1 and Year 2, and assisting in forest school sessions. 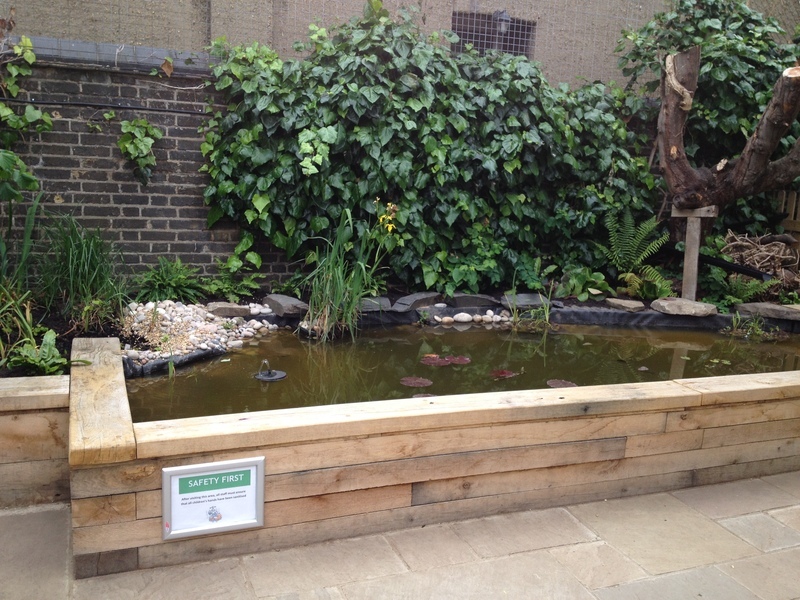 We are very grateful to Heathrow Community Fund for funding this project. 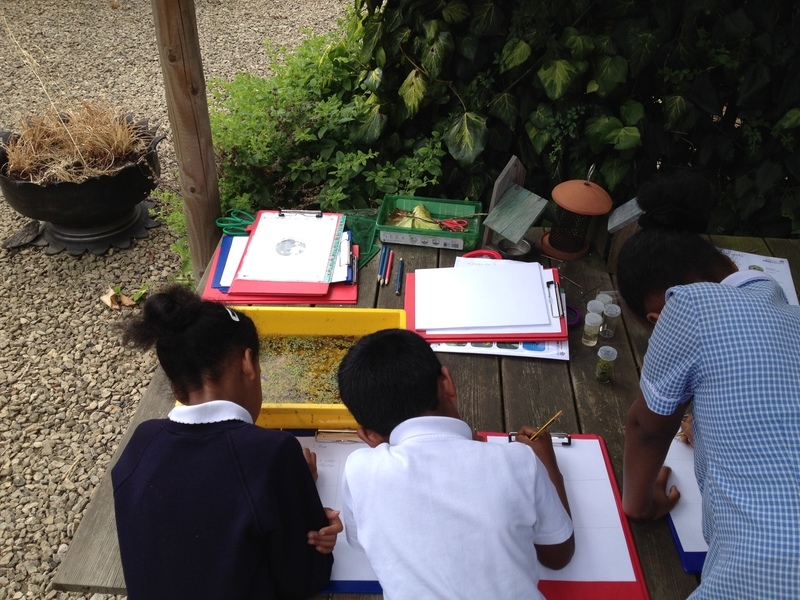 Children and teachers have thoroughly enjoyed getting outside and are all looking forward to continuing their projects into the future. Heathrow Community Fund is part of an independent grant-making charity set up by Heathrow’s owners to support and strengthen local communities close to the airport. 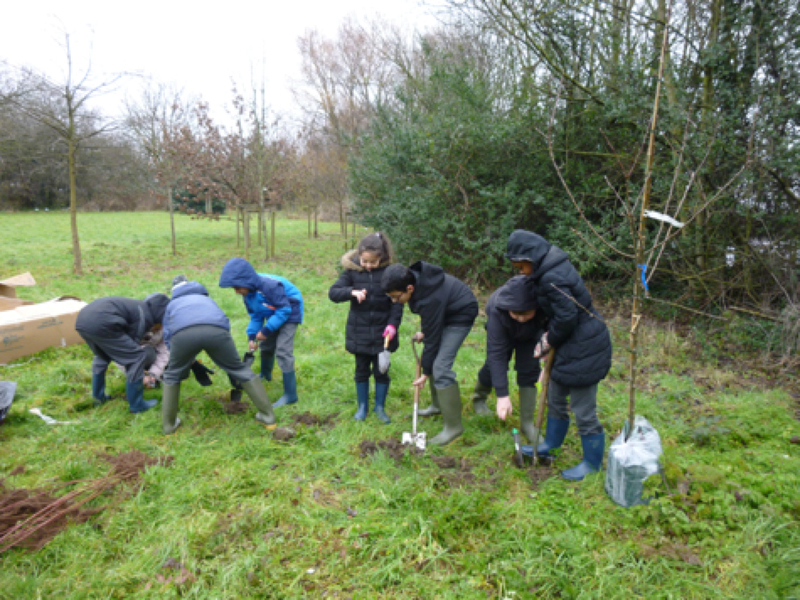 In the past two years it has donated more than £1 million through three grant programmes, funding projects which support young people, help protect the environment and support active local communities. Funds come from an annual donation from the airport, donations from airline passengers and fines imposed on aircraft that breach noise limits. 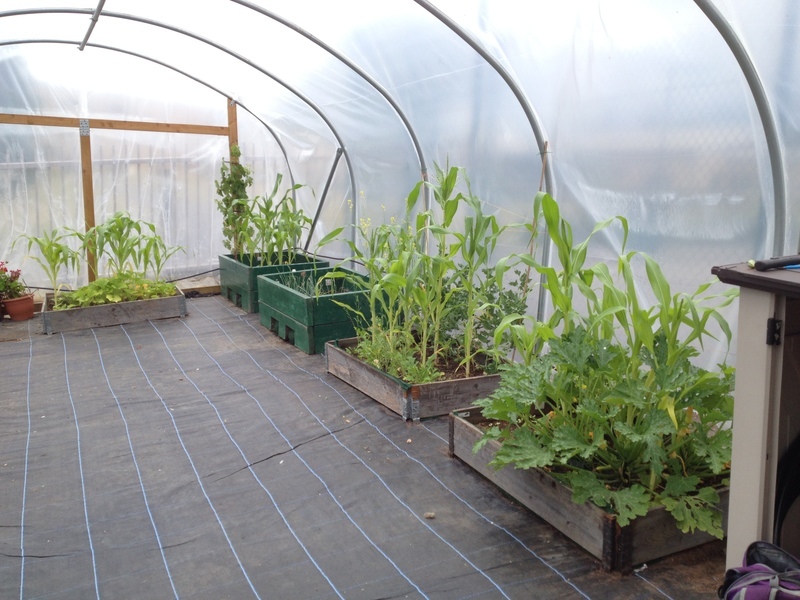 Vital additional support for Roots to Green Living was provided by the Ernest Cook Trust.